Now, a Reno artist will be making his international debut, having been invited to exhibit his work in a juried art competition in Italy. He won’t be going abroad, however, to bask in the aura of great Italian masters. Instead, this artist will remain at home, contemplating his next masterpiece while gnawing on his paintbrushes — between mouthfuls of hay. 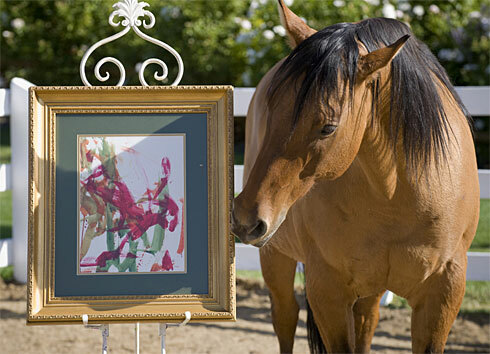 Cholla (pronounced CHOY-ah) is a mustang-quarter horse mix whose paintings have been featured in art exhibits from San Francisco to New York and now overseas. His creation, The Big Red Buck, was selected for exhibit in the 3rd International Art Prize Arte Laguna, Oct. 18-Nov. 2, Mogliano Veneto, Italy. Since Cholla rhymes with Goya I decided to make this an educational post. Preferably and pointedly after the plein air pony pics with palette and poserly poise. I am stuck on alliteration today. Pensive Pony in plein air. Cholla, the painterly pony of pleasing palettes. I think I'd not have chosen that frame for that painting however but that's just Moi. Cholla is thinking the same thing, as one can pleinly see, by his pondering pose. Goya, at tea time. Don't be scrayed, he's just playing. I have been using 'scrayed' over 'scared' since 2000. Some typos are worth keeping. Don't go changing. 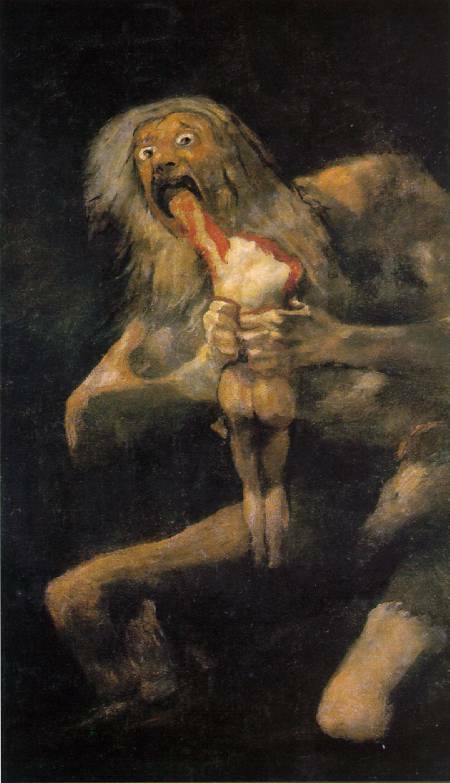 But really, this is the real (ish) title - Saturn Devouring His Son, 1819. The title, like all those given to the Black Paintings, was assigned by others after Goya's death. Cholla in his plein air studio posing for the photographer.